Your pores will be open and your cells will act like sponges readily absorbing all the minerals in the clay rapidly aiding your recovery process. Clay acts to naturally control excessive inflammation, so if you pushed your limits, you'll reduce the time needed to optimally recover. Liberally apply Rock On atop the muscles that you really worked that day and/or those that felt sore or tight. Likewise, give your feet a good rub because chances are they are your best set of wheels. The skin on the feet are also devoid of sebaceous glands, therefore rendering an auspicious channel of absorption. Besides the soothing essential oils that help your muscles relax, the clay will have an opportunity to penetrate with less chance of being rubbed off like during your daily activities. Soaking in all night long will allow the clay to work its magic, drawing out toxins and replenishing lost minerals. Sleeping is your body's time for healing, so optimize it as best you can. Rolling on a ball or a roller is a fantastic post-workout ritual that we recommend. 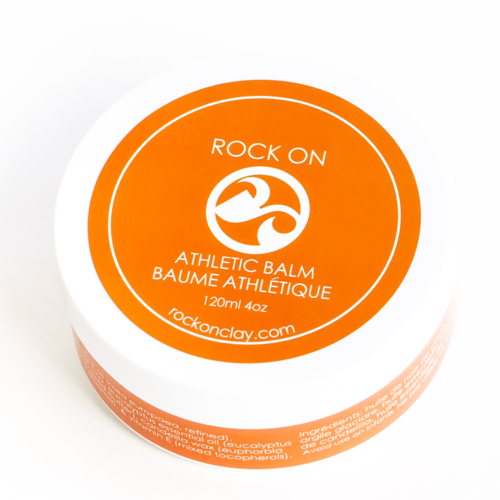 Once you are done rolling, rub your muscles with Rock On. This will assist waste removal and increase nourishment via improved circulation to your muscles and fascia. If you see a massage therapist, have them use Rock On especially on those hard to reach areas such as your mid back. As diligent as you are in your training, maximize your recovery routine to match your rockin' efforts. Soar, not sore! !